I have been quiet in this space lately. But not quiet overall. When I haven’t been doing client work, I’ve been busy doing a lot of writing. Far more than I usually do. I spent most of January working on a 31 Day Clean Up Your Blog series over at Food Bloggers of Canada along with my charming chum and FBC partner in crime, Ethan Adeland. Somewhere during those 31 days, I managed to launch a new site for one of my all time favourite food bloggers, Movita Beaucoup. If you haven’t read her blog, do yourself a favour and go right now because, she’s funny. Like, laugh out loud freaking funny. And she makes cake. Beautiful cakes. Right after the 31 Days, E and I launched the new FBC site and well… let’s just say, I was a little bit pooped after January was done. Very proud of the work we did but pooped none the less! Now we’re in full on planning mode for FBC2014 so there’s no slowing down but, as per my 2014 goals, I did make sure Ethan and I went out for a beer after launch to celebrate and savour the moment before jumping into the next project! Just before Christmas, I received a copy of Butter Baked Goods, which I was very excited about because, I’m not going to lie, it’s one of the prettiest cookbooks I’ve ever owned. And, as the title would suggest, it’s full of baked goods – specifically from Rosie Daykin’s Butter Baked Goods Cafe. I’m going to get the two most embarrassing parts of this post out of the way right now. Embarrassing Thing #2: This was originally going to be a post about the book, the muffins and a post processing discussion on Lightroom and Photoshop actions. 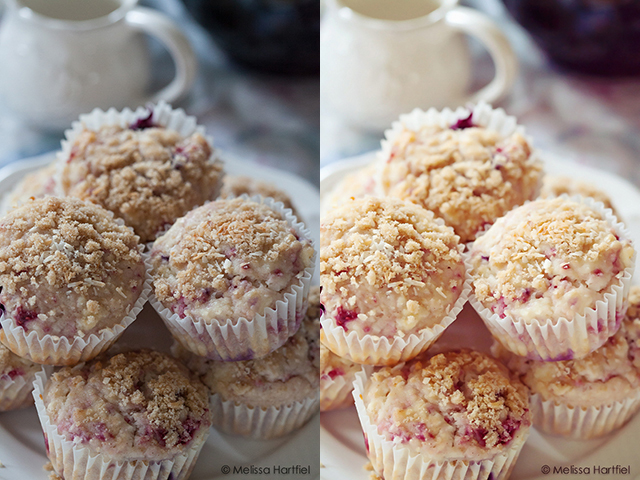 The problem is, I made the muffins and edited all the photos over a month ago and I cannot for the life of me remember what or how I post processed them (I didn’t keep my photoshop files…). So this won’t be exactly as I’d hoped. But we’ll talk about post processing with actions another day in more detail. First, the book. The book sold out of it’s first printing way faster than was expected when it was released last October but I believe the second printing is available now. It is, in a word, beautiful. Nostalgic, beautifully photographed, well written and full of treats that will take you back to childhood – including the bakery’s specialty, homemade marshmallows and “The Homemade You Know What” cookie. Everything from the simple to the truly decadent. The photography is luscious. I am absolutely in love with the work of Vancouver photographer Janis Nicolay. She captured the mood of this book so beautifully and so consistently – something I rarely feel when I look at most cookbooks. 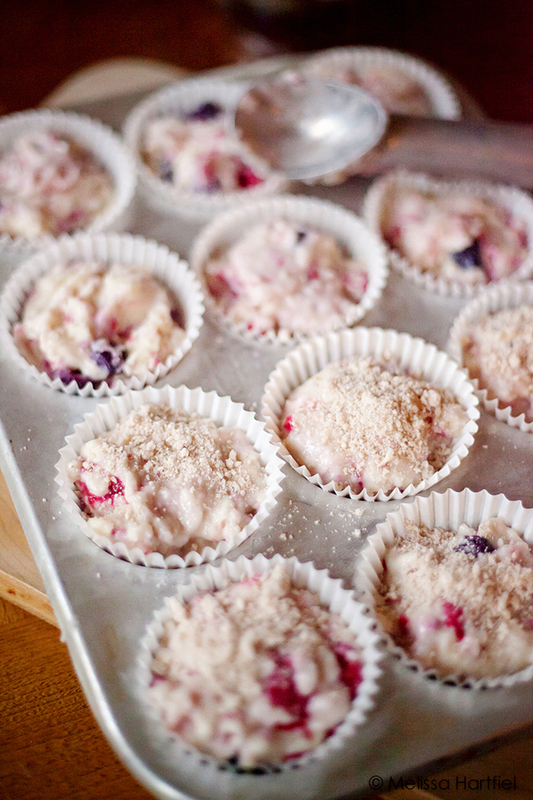 I decided to make the Mixed Berry Crumble Top Muffins for my first recipe – with a few edits. Namely, the addition of coconut, which to be frank, I think I should have toasted first, but I was lazy and didn’t. And… embarrassing thing #3 is… I didn’t write down my recipe edits so I don’t even have a recipe to share with you. I just couldn’t bare to waste the photos because, I was really happy with them! You’ll just have to buy a copy of the book to try them for yourself! I have been in the mood to photograph things that are more… well… for lack of a better word, girlie, as of late. If you follow me with any regularity then you know I tend to favour simple setups, bright colours and a more graphic feel. But all of a sudden I want muted pastels, florally prints and shabby chic accessories. It’s very unlike me. I want to have a tea party with chintz teacups! I think maybe I need spring to arrive very soon, no? But this book and this recipe felt like the perfect opportunity to veer off course a bit. It was harder than I thought because… well… I don’t really own anything particularly flowery or chintz-y. I had to scrounge a bit in my prop cupboard but I think I pulled it off. I wanted to do a more in depth post on how post processing techniques can really enhance the mood of a photo. I belong to the school of thought that believes that photography is the art of capturing an image with a camera and doing everything you can to make your image feel the way you saw it with your mind’s eye in the camera. Post processing is definitely part of the process. I don’t argue that at all. But where I do feel challenged is where in the post editing process do you push beyond the boundaries of photography as an art form and into the realm of being a digital artist in Lightroom or Photoshop? I tend to think that line is crossed much earlier in the process than many other people do. Post processing gives you a lot of opportunities to dramatically alter the mood of a photograph with digital brush strokes and it can be a tremendous amount of fun (ask anyone who’s ever added a filter in Instgram!) and very creative – an artform in its own right. As I said, I’ll get into that another time but, in the above photo you can see how different the same image looks with three different edits. I often find food looks best with what I call a “clean edit”. To me, a clean edit is where you take the original photo and simply do a few contrast and saturation adjustments, some sharpening and possibly correcting white balance or exposure if you messed up in camera. Creative edits involve things like adding lens flare or vignetting, cross processing, and adding actions and filters. Food is tricky because it’s very easy to make it look… well… unappealing. As a friend of mine says, “I really don’t want to look at food photos where it looks like the food might be WWII army ration surplus” If you look at the photo directly above, the clean edit is the one on the left. But the creative edit is on the right. This is one instance where I think the creative edit works better. In the long vertical image above, the top photos is the clean edit and middle and bottom image are the creative edits. In that case, I think the clean edit works best. Working on creative edits can be very fun and feel like being a kid in a candy store and I do recommend you take some time to play. But remember, less is often more with food! Try some of your creative edits on photos other than food as well – you might really enjoy the results! Disclosure Notice: I received a complimentary copy of Butter Baked Goods from Appetite by Random House. I was not asked to write about it and did so because I loved the book. There are no affiliate links in this post. i have seen some really stunning black and white food photography but it’s really difficult to pull off – I think for exactly the reasons you mentioned: colour is integral to our enjoyment of food but also, black and white requires a different mindset when setting up the shot – the subtle nuances in colour and shading can be lost if you don’t light it properly. I think it suits itself well to beverage shots with high contrast. I was in the Hyatt in Vancouver recently and they have lined one of their walls with black and white kitchen prep shots and it’s quite beautiful. I think that’s an instance where it worked really well. Truth be told, I love post processing and doing creative edits as much as I love photography. Photography is like golf – you are only competing with yourself and the challenge of getting it right in camera pushes me forward. 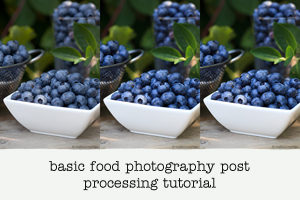 But post-processing is like creative playtime and that’s just fun. 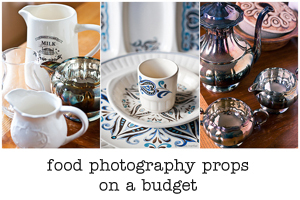 I keep an eye on Martha Stewart Living… I find it a bit of a trendsetter – even over Saveur and Bon Apetit – when it comes to photography and design and colour palettes. 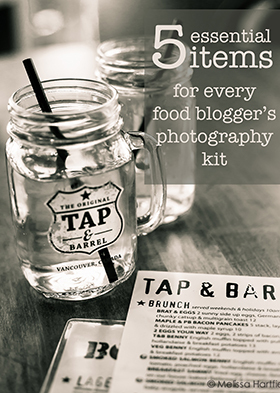 I totally agree – kitchen shots, prep work, drinks, utensils – all gorgeous in black and white. Pancakes? Trickier. Oh dear, now there’s another cookbook I simply must add to my collection! Thank you for introducing me. 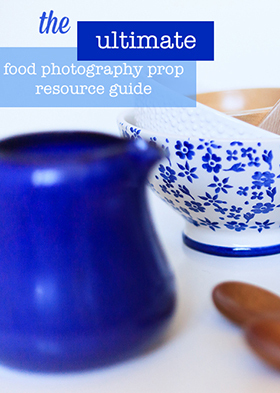 I have so much to learn about food photography, and appreciate everything you teach us here. Thanks to this post, I now know that what I do is clean editing — sharpening, adjusting shadows and highlights, and sometimes the definition, along with cropping. Pretty simple and basic stuff. I use iPhoto for all this. I admit that I have Aperture but have felt intimidated every time I’ve attempted to do something on the more creative side. I definitely need to sign up for an online course. In the meantime, I will gaze longingly at your beautiful muffin photos — so pretty and feminine, and I so needed a dose of that. I just did a photo shoot of a bowl of chill set against the backdrop of my snowy backyard. It was a thrill when I discovered in late November how great food photography can be in the snow, but let’s just say the thrill is waning as we prepare for yet another snowstorm to roll in tonight. Give me pretty, flowery tables settings that sing spring! I think you should just get in Aperture and play! A class is a great idea but just make copies of a few photos (if you shoot in .jpg) that you think you might like to mess about with and then start sliding sliders and pressing buttons! It’s a lot of fun. The originals will be safe and sound if you’re playing with copies and you don’t have to be afraid or intimidated! I’ve had some fun snow shoots too but Vancouver is so dark and gloomy and rainy in winter that it’s rare to get to do them. I think we’re all suffering from a lack of spring-time! Just added “Butter” to my Amazon wish list. I’m so new to photography. It seems that when I first tried using my camera in manual mode I just randomly moved dials around hoping for the best. I’m still hoping for the best but I feel I have a least some intention behind the adjustments. So now… I come to lightroom and I feel like I am just randomly moving dials around hoping for the best. I find it so hard to know where to stop, what to correct, how to correct. Then there is the question of whether or not it “looks right” – being new to photography I think I still need to develop the confidence to feel that I am seeing it right. This does sound like a wonderful cookbook and I will have to check it out. The muffins look great and your various photographs of them are all appealing to me. 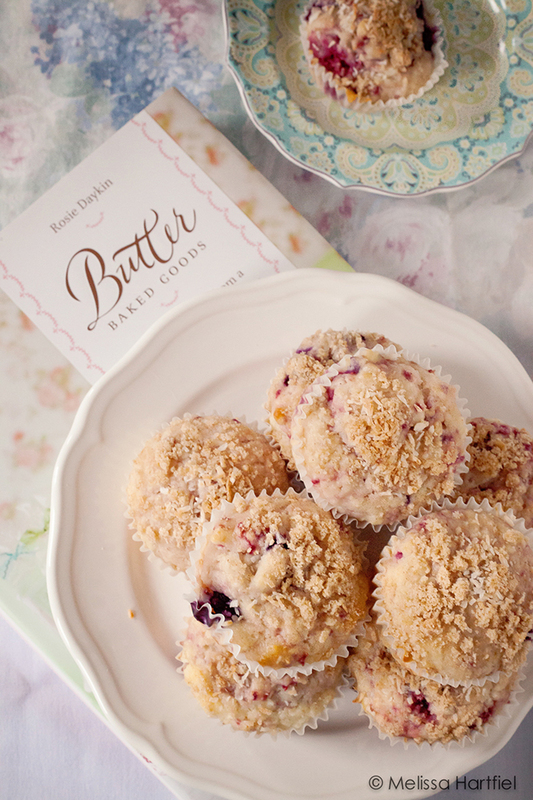 wow I am smitten with those glorious muffins and the photography. I wish I could grab one off from the screen. Absolutely irresistible! 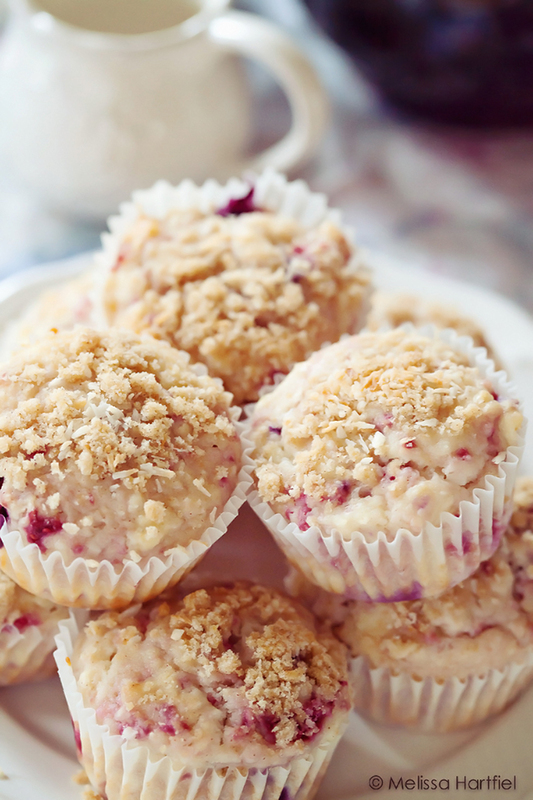 Lovely images and tasty looking berry muffins, Melissa. I told myself with the new year “no more cookbooks” and now I find there’s several already in my Amazon cart just waiting to be purchased – now this one included! Nice chat on post processing. I really enjoy that part of the process too – was frustrated couldn’t upgrade to LR5 until I upgraded my OS (grrrr on Adobe!!). You’ve been busy – great new sites you’ve launched! Envious of the FBC community!